There are a number of educational games for preschoolers that will develop the skills required for reading and foster a love of reading. Having preschoolers engage in any physical activity for sustained periods (15-30 minutes) is great for preparing them to learn to read. Walking, playing ball, climbing, skating, swimming are all invaluable for fun, relieving stress, all building stamina – all great reading readiness skills. Name ball is one of many physical games that build these skills. Requirements: A group of children and an adult. How to play: Have the children stand in a circle around you. Throw a ball into the air as high as you can and call out a child’s name. The child whose name you called then tries to catch the ball as it comes down. If this child succeeds in catching the ball, he or she then takes your place in the middle of the circle. Encourage children to call out a different name each time they have the ball. The rules: Give each child in the circle a chance to catch the ball by calling out their name. How to win: Catch the ball when your name is called. For interactive reading games, visit our reading games for kids page. 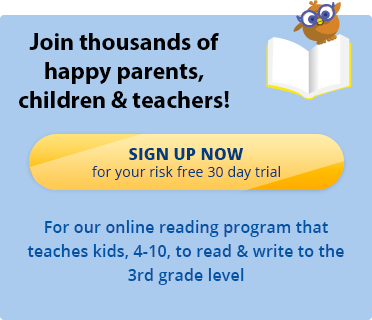 Try the reading program that’s disguised as a game! The Reading Kingdom online reading program is one of the leading reading games for kids. It has helped thousands of children to learn to read and write to a third grade level. Sign up for a 30 day free trial today.